The Madison Park Joanna 6 Piece Reversible Cotton Sateen Coverlet Set easily refreshes your bedroom decor. 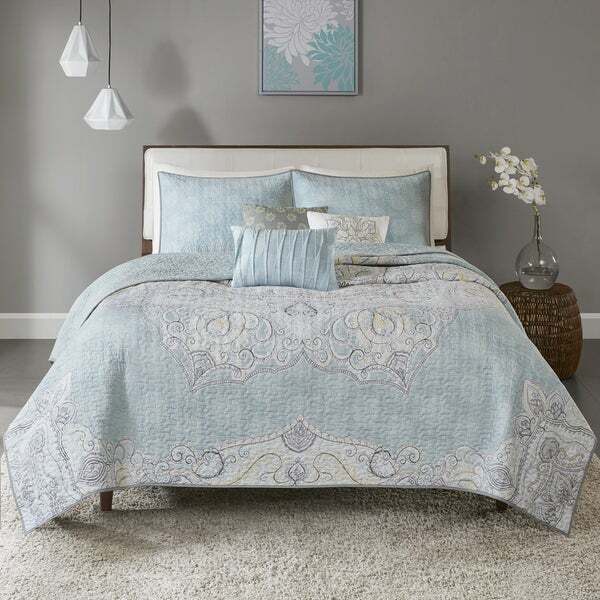 Completely reversible, this quilted coverlet features an over-scale printed medallion with delicate motifs in seafoam, white, and grey hues and a blue patterned reverse that creates a graceful look. Cotton rich filling within the coverlet boasts exceptional softness and warmth to keep you comfortable. The matching shams mirror the reverse of the coverlet for a beautiful coordinated ensemble, while three embroidered decorative pillows, in corresponding colors, add dimension and charm. With its globally inspired style, this cotton sateen coverlet set displays an elegant sheen and is machine washable for easy care. This Joanna Blue Reversible Cotton Sateen Coverlet Set is gorgeous with colors of light blue, yellow, gray and white. My only complaint that it isn’t durable and it ripped easy after my cat jumped on it and got his claw stuck. It is a great bedding, just not for someone with pets. I love this item. So bright and cheery...perfect for my master bedroom. Even my husband loves it. 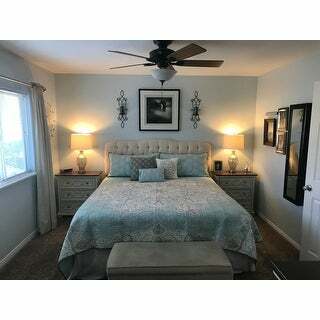 This coverlet is lovely and looks great on my bed which is a queen but is a on very high mattresses making the king coverlet perfect fit. Design and details are quality. Perfect! One of the few times where the colors of the photos match what actually arrived! It’s lightweight (what I wanted) and is subtle and beautiful in my bed! It is beautiful. It looks fresh and clean and I love the colors. Looks just like it did in the picture. beautiful! was prettier than I thought. I use it as a scarf quilt at foot of the bed. I liked the pattern & color but didn’t like that it’s not as soft as the others I’ve purchased. Beautiful and soft. Quality is excellent. Really brightened the guest room. So soft. Fits perfect on the bed. "Is this light blue? Or toward greenish? " Its more of a light blue color.